Today, this mystery shrub has been entertaining a varied host of bees and wasps. Some were so small, I could barely see them. Some looked like half-size honeybees with long eyelash-like antennae. The biggest was a middling bumblebee. There was also some sort of red bug, though definitely not a ladybug. All of them were loving these sweet-smelling white racemes, and totally ignoring the spirea right next to it. So what is this anyway? 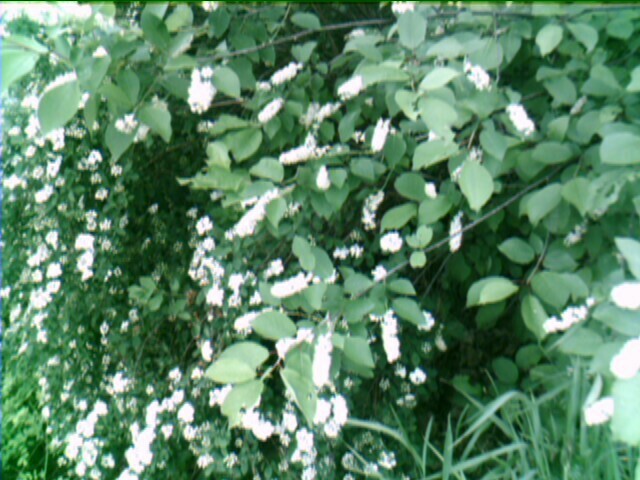 It appears to be Itea virginica, or Virginia sweetspire. It’s been slowly spreading in the corner it’s claimed. And in my yard, a plant that feeds so many bees can spread all it likes. Plus, I found circular holes in the leaves of a pear tree. So I think there’s leafcutter bees zipping around somewhere. Maybe those little brown bees I’ve seen hovering near the ground.